اختروَش یا کوِیزار یا کوازار (به انگلیسی: Quasar)، یک هستهٔ فعال به شدت نورانی و دوردست است که وابسته به یک کهکشان جوان است. آنها در ردهٔ یک کلاس از اشیا به نام هسته کهکشانی فعال قرار دارند. در ویکی‌انبار پرونده‌هایی دربارهٔ اختروش موجود است. This article is about the astronomical object. For other uses, see Quasar (disambiguation). "Quasi-stellar object" redirects here. It is not to be confused with quasi-star. Not to be confused with Quaoar. A quasar (/ˈkweɪzɑːr/) (also known as a QSO or quasi-stellar object) is an extremely luminous active galactic nucleus (AGN). It has been theorized that most large galaxies contain a supermassive central black hole with mass ranging from millions to billions of times the mass of the Sun. In quasars and other types of AGN, the black hole is surrounded by a gaseous accretion disk. As gas falls toward the black hole, energy is released in the form of electromagnetic radiation, which can be observed across the electromagnetic spectrum. 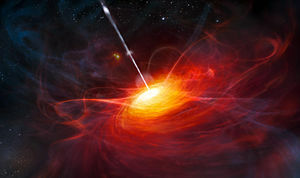 The power radiated by quasars is enormous: the most powerful quasars have luminosities thousands of times greater than a galaxy such as the Milky Way. 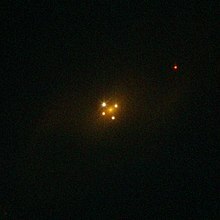 The term "quasar" originated as a contraction of quasi-stellar [star-like] radio source, because quasars were first identified during the 1950s as sources of radio-wave emission of unknown physical origin, and when identified in photographic images at visible wavelengths they resembled faint star-like points of light. 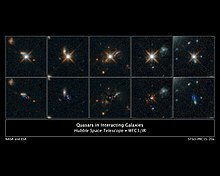 High-resolution images of quasars, particularly from the Hubble Space Telescope, have demonstrated that quasars occur in the centers of galaxies, and that some host-galaxies are strongly interacting or merging galaxies. As with other categories of AGN, the observed properties of a quasar depend on many factors including the mass of the black hole, the rate of gas accretion, the orientation of the accretion disk relative to the observer, the presence or absence of a jet, and the degree of obscuration by gas and dust within the host galaxy. Quasars are found over a very broad range of distances, and quasar discovery surveys have demonstrated that quasar activity was more common in the distant past. The peak epoch of quasar activity was approximately 10 billion years ago. As of 2017, the most distant known quasar is ULAS J1342+0928 at redshift z = 7.54; light observed from this quasar was emitted when the universe was only 690 million years old. The supermassive black hole in this quasar, estimated at 800 million solar masses, is the most distant black hole identified to date. British-Australian astronomer John Bolton made many early observations of quasars, including a breakthrough in 1962. Another radio source, 3C 273, was predicted to undergo five occultations by the Moon. Measurements taken by Cyril Hazard and John Bolton during one of the occultations using the Parkes Radio Telescope allowed Maarten Schmidt to find a visible counterpart to the radio source and obtain an optical spectrum using the 200-inch Hale Telescope on Mount Palomar. This spectrum revealed the same strange emission lines. 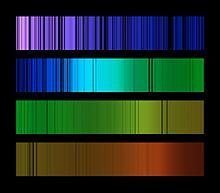 Schmidt was able to demonstrate that these were likely to be the ordinary spectral lines of hydrogen redshifted by 15.8 percent - an extreme redshift never seen in astronomy before. If this was due to the physical motion of the "star", then 3C 273 was receding at an enormous velocity, around 47,000 km/s, far beyond the speed of any known star and defying any obvious explanation. Nor would an extreme velocity help to explain 3C 273's huge radio emissions. Schmidt noted that redshift is also associated with the expansion of the universe, as codified in Hubble's law. If the measured redshift was due to expansion, then this would support an interpretation of very distant objects with extraordinarily high luminosity and power output, far beyond any object seen to date. This extreme luminosity would also explain the large radio signal. Schmidt concluded that 3C 273 could either be an individual star around 10 km wide within (or near to) our galaxy, or a distant active galactic nucleus. He stated that a distant and extremely powerful object seemed more likely to be correct. Schmidt's explanation for the high redshift was not widely accepted at the time. 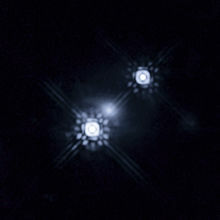 A major concern was the enormous amount of energy these objects would have to be radiating, if they were distant. In the 1960s no commonly-accepted mechanism could account for this. The currently accepted explanation, that it is due to matter in an accretion disc falling into a supermassive black hole, was only suggested in 1964 by Salpeter and Yakov Zel'dovich, and even then it was rejected by many astronomers, because the existence of black holes was still widely seen as theoretical and too exotic, in the 1960s, and because it was not yet confirmed that many galaxies (including our own) have supermassive black holes at their center. The strange spectral lines in their radiation, and the speed of change seen in some quasars, also suggested to many astronomers and cosmologists that the objects were comparatively small and therefore perhaps bright, massive and not far away; accordingly that their redshifts were not due to distance or velocity, and must be due to some other reason or an unknown process, meaning that the quasars were not really powerful objects nor at extreme distances, as their redshifted light implied. A common alternative explanation was that the redshifts were caused by extreme mass (gravitational redshifting explained by general relativity) and not by extreme velocity (explained by special relativity). Various explanations were proposed during the 1960s and 1970s, each with their own problems. It was suggested that quasars were nearby objects, and that their redshift was not due to the expansion of space (special relativity) but rather to light escaping a deep gravitational well (general relativity). This would require a massive object, which would also explain the high luminosities. However a star of sufficient mass to produce the measured redshift would be unstable and in excess of the Hayashi limit. Quasars also show forbidden spectral emission lines which were previously only seen in hot gaseous nebulae of low density, which would be too diffuse to both generate the observed power and fit within a deep gravitational well. There were also serious concerns regarding the idea of cosmologically distant quasars. One strong argument against them was that they implied energies that were far in excess of known energy conversion processes, including nuclear fusion. There were some suggestions that quasars were made of some hitherto unknown form of stable antimatter regions and that this might account for their brightness. Others speculated that quasars were a white hole end of a wormhole, or a chain reaction of numerous supernovae. Quasars are believed - and in many cases confirmed - to be powered by accretion of material into supermassive black holes in the nuclei of distant galaxies, as suggested in 1964 by Edwin Salpeter and Yakov Zel'dovich. Light and other radiation cannot escape from within the event horizon of a black hole, but the energy produced by a quasar is generated outside the black hole, by gravitational stresses and immense friction within the material nearest to the black hole, as it orbits and falls inward. The huge luminosity of quasars results from the accretion discs of central supermassive black holes, which can convert between 6% and 32% of the mass of an object into energy, compared to just 0.7% for the p-p chain nuclear fusion process that dominates the energy production in Sun-like stars. 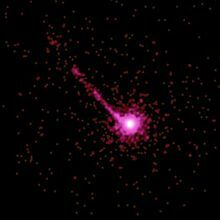 Central masses of 105 to 109 solar masses have been measured in quasars by using reverberation mapping. Several dozen nearby large galaxies, including our own Milky Way galaxy, that do not have an active center and do not show any activity similar to a quasar, are confirmed to contain a similar supermassive black hole in their nuclei (galactic center). Thus it is now thought that all large galaxies have a black hole of this kind, but only a small fraction have sufficient matter in the right kind of orbit at their center to become active and power radiation in such a way as to be seen as quasars. The highest redshift quasar known (as of December 2017[update]) is ULAS J1342+0928, with a redshift of 7.54, which corresponds to a comoving distance of approximately 29.36 billion light-years from Earth (these distances are much larger than the distance light could travel in the universe's 13.8 billion year history because space itself has also been expanding). More than 200,000 quasars are known, most from the Sloan Digital Sky Survey. All observed quasar spectra have redshifts between 0.056 and 7.54 (as of 2017). Applying Hubble's law to these redshifts, it can be shown that they are between 600 million and 29.36 billion light-years away (in terms of comoving distance). Because of the great distances to the farthest quasars and the finite velocity of light, they and their surrounding space appear as they existed in the very early universe. Animation shows the alignments between the spin axes of quasars and the large-scale structures that they inhabit. The intense production of ionizing ultraviolet radiation is also significant, as it would provide a mechanism for reionization to occur as galaxies form. 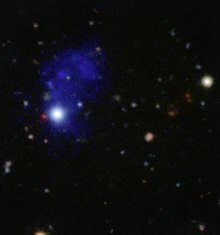 Despite this, current theories suggest that quasars were not the primary source of reionization; the primary causes of reionization were probably the earliest generations of stars, known as Population III stars (possibly 70%), and dwarf galaxies (very early small high-energy galaxies) (possibly 30%). ^ "Most Distant Quasar Found". ESO Science Release. Retrieved 4 July 2011. ^ Wu, Xue-Bing; et al. (2015). "An ultraluminous quasar with a twelve-billion-solar-mass black hole at redshift 6.30". Nature. 518 (7540): 512–5. arXiv:1502.07418. Bibcode:2015Natur.518..512W. doi:10.1038/nature14241. PMID 25719667. ^ Bahcall, J. N.; et al. (1997). "Hubble Space Telescope Images of a Sample of 20 Nearby Luminous Quasars". The Astrophysical Journal. 479 (2): 642–658. arXiv:astro-ph/9611163. Bibcode:1997ApJ...479..642B. doi:10.1086/303926. ^ Schmidt, Maarten; Schneider, Donald; Gunn, James (1995). "Spectroscopic CCD Surveys for Quasars at Large Redshift.IV.Evolution of the Luminosity Function from Quasars Detected by Their Lyman-Alpha Emission". The Astronomical Journal. 110: 68. Bibcode:1995AJ....110...68S. doi:10.1086/117497. ^ Bañados, Eduardo; et al. (6 March 2018). "An 800-million-solar-mass black hole in a significantly neutral Universe at a redshift of 7.5". Nature. 553 (7689): 473–476. arXiv:1712.01860. Bibcode:2018Natur.553..473B. doi:10.1038/nature25180. PMID 29211709. ^ Choi, Charles Q. (6 December 2017). "Oldest Monster Black Hole Ever Found Is 800 Million Times More Massive Than the Sun". Space.com. Retrieved 6 December 2017. ^ Landau, Elizabeth; Bañados, Eduardo (6 December 2017). "Found: Most Distant Black Hole". NASA. Retrieved 6 December 2017. ^ Chiu, Hong-Yee (1964). "Gravitational collapse". Physics Today. 17 (5): 21. doi:10.1063/1.3051610. ^ "Hubble Surveys the "Homes" of Quasars". HubbleSite. 1996-11-19. Retrieved 2011-07-01. ^ "7. HIGH-ENERGY ASTROPHYSICS ELECTROMAGNETIC RADIATION". Neutrino.aquaphoenix.com. Retrieved 2011-07-01. ^ a b Shields, Gregory A. (1999). "A BRIEF HISTORY OF AGN". The Publications of the Astronomical Society of the Pacific. 111 (760): 661–678. arXiv:astro-ph/9903401. Bibcode:1999PASP..111..661S. doi:10.1086/316378. Retrieved 3 October 2014. ^ "Our Activities". European Space Agency. Retrieved 3 October 2014. ^ Matthews, Thomas A.; Sandage, Allan R. (1963). "Optical Identification of 3c 48, 3c 196, and 3c 286 with Stellar Objects". Astrophysical Journal. 138: 30–56. Bibcode:1963ApJ...138...30M. doi:10.1086/147615. ^ Wallace, Philip Russell (1991). Physics: Imagination and Reality. ISBN 9789971509293. ^ "The MKI and the discovery of Quasars". Jodrell Bank Observatory. Retrieved 2006-11-23. ^ Schmidt Maarten (1963). "3C 273: a star-like object with large red-shift". Nature. 197 (4872): 1040. Bibcode:1963Natur.197.1040S. doi:10.1038/1971040a0. ^ Maarten Schmidt (1963). "3C 273: a star-like object with large red-shift". Nature. 197 (4872): 1040. Bibcode:1963Natur.197.1040S. doi:10.1038/1971040a0. ^ S. Chandrasekhar (1964). "The Dynamic Instability of Gaseous Masses Approaching the Schwarzschild Limit in General Relativity". Astrophysical Journal. 140 (2): 417–433. Bibcode:1964ApJ...140..417C. doi:10.1086/147938. ^ J. Greenstein & M. Schmidt (1964). 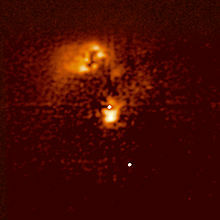 "The Quasi-Stellar Radio Sources 3C 48 and 3C". Astrophysical Journal. 140 (1): 1–34. Bibcode:1964ApJ...140....1G. doi:10.1086/147889. ^ Lynch, Kendall Haven; illustrated by Jason (2001). That's weird! : awesome science mysteries. Golden, Colo.: Fulcrum Resources. pp. 39–41. ISBN 9781555919993. ^ Santilli, Ruggero Maria (2006). Isodual theory of antimatter : with applications to antigravity, grand unification and cosmology. Dordrecht: Springer. p. 304. Bibcode:2006itaa.book.....S. ISBN 978-1-4020-4517-2. ^ Keel, William C. (October 2009). "Alternate Approaches and the Redshift Controversy". The University of Alabama. Retrieved 2010-09-27. ^ a b c Thomsen, D. E. (Jun 20, 1987). "End of the World: You Won't Feel a Thing". Science News. 131 (25): 391. doi:10.2307/3971408. JSTOR 3971408. ^ "MUSE spies accreting giant structure around a quasar". www.eso.org. Retrieved 20 November 2017. ^ "Active Galaxies and Quasars – Double Quasar 0957+561". Astr.ua.edu. Retrieved 2011-07-01. ^ Grupen, Claus; Cowan, Glen (2005). Astroparticle physics. Springer. pp. 11–12. ISBN 978-3-540-25312-9. ^ a b Lambourne, Robert J. A. (2010). Relativity, Gravitation and Cosmology (Illustrated ed.). Cambridge University Press. p. 222. ISBN 978-0521131384. ^ a b Tiziana Di Matteo; et al. (10 February 2005). "Energy input from quasars regulates the growth and activity of black holes and their host galaxies". Nature. 433 (7026): 604–607. arXiv:astro-ph/0502199. Bibcode:2005Natur.433..604D. doi:10.1038/nature03335. PMID 15703739. ^ "Galaxy für Dehnungsstreifen" (PDF). Archived from the original (PDF) on December 17, 2008. Retrieved December 30, 2009. ^ "Peter J. Barthel, Is every Quasar beamed?, The Astrophysical Journal, 336:606–611, 1989". Adsabs.harvard.edu. Retrieved 2011-07-01. ^ Bañados, Eduardo; et al. (6 December 2017). "An 800-million-solar-mass black hole in a significantly neutral Universe at a redshift of 7.5". Nature. 553 (7689): 473–476. arXiv:1712.01860. Bibcode:2018Natur.553..473B. doi:10.1038/nature25180. PMID 29211709. ^ "Bright halos around distant quasars". www.eso.org. Retrieved 26 October 2016. ^ "Hubble Uncovers a Hidden Quasar in a Nearby Galaxy (Cygnus A)". HubbleSite. 1994-09-21. Retrieved 2011-07-01. ^ a b Greenstein, Jesse L.; Schmidt, Maarten (1964). "The Quasi-Stellar Radio Sources 3C 48 and 3C 273". The Astrophysical Journal. 140: 1. Bibcode:1964ApJ...140....1G. doi:10.1086/147889. ^ "Gravitationally lensed quasar HE 1104-1805". ESA/Hubble Press Release. Retrieved 4 November 2011. ^ Dooling D. "BATSE finds most distant quasar yet seen in soft gamma rays Discovery will provide insight on formation of galaxies". Archived from the original on 2009-07-23. ^ Nickolay Gnedin; Jeremiah Ostriker (1997). "Reionization of the Universe and the Early Production of Metals". Astrophysical Journal. 486 (2): 581–598. arXiv:astro-ph/9612127. Bibcode:1997ApJ...486..581G. doi:10.1086/304548. ^ R.J.Bouwens; et al. (2012). "Lower-luminosity Galaxies Could Reionize the Universe: Very Steep Faint-end Slopes to the UV Luminosity Functions at z >= 5–8 from the HUDF09 WFC3/IR Observations". The Astrophysical Journal Letters. 752 (1): L5. arXiv:1105.2038. Bibcode:2012ApJ...752L...5B. doi:10.1088/2041-8205/752/1/L5. ^ Piero Madau; et al. (1999). "Radiative Transfer in a Clumpy Universe. III. The Nature of Cosmological Ionizing Source". The Astrophysical Journal. 514 (2): 648–659. arXiv:astro-ph/9809058. Bibcode:1999ApJ...514..648M. doi:10.1086/306975. ^ Paul Shapiro; Mark Giroux (1987). "Cosmological H II regions and the photoionization of the intergalactic medium". The Astrophysical Journal. 321: 107–112. Bibcode:1987ApJ...321L.107S. doi:10.1086/185015. ^ "NASA Goddard Space Flight Center: News of light that may be from population III stars". Nasa.gov. Retrieved 2011-07-01. ^ a b c Peterson, Bradley (1997). Active Galactic Nuclei. Cambridge University Press. ISBN 0 521 47911 8. ^ Zakamska, Nadia; et al. (2003). 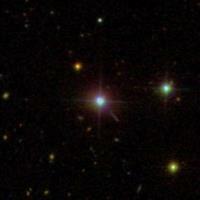 "Candidate Type II Quasars from the Sloan Digital Sky Survey. I. Selection and Optical Properties of a Sample at 0.3<Z<0.83". The Astronomical Journal. 126 (5): 2125. arXiv:astro-ph/0309551. Bibcode:2003AJ....126.2125Z. doi:10.1086/378610. ^ Glikman, Eilat; et al. (2007). 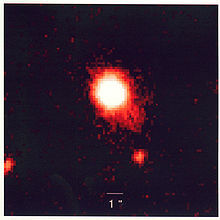 "The FIRST-2MASS Red Quasar Survey". The Astrophysical Journal. 667 (2): 673. arXiv:0706.3222. Bibcode:2007ApJ...667..673G. doi:10.1086/521073. ^ Diamond-Stanic, Aleksandar; et al. (2009). "High-redshift SDSS Quasars with Weak Emission Lines". The Astrophysical Journal. 699 (1): 782–799. arXiv:0904.2181. Bibcode:2009ApJ...699..782D. doi:10.1088/0004-637X/699/1/782. 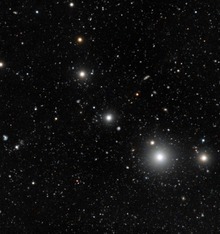 ^ "Dark Galaxies of the Early Universe Spotted for the First Time". ESO Press Release. Retrieved 13 July 2012. ^ "ICRS Narrative". U.S. Naval Observatory Astronomical Applications. Retrieved 2012-06-07. ^ Blandford, R. D.; Narayan, R. (1992). "Cosmological applications of gravitational lensing". Annual Review of Astronomy and Astrophysics. 30: 311–358. Bibcode:1992ARA&A..30..311B. doi:10.1146/annurev.aa.30.090192.001523. ^ Rincon, Paul (2007-01-09). "Astronomers see first quasar trio". BBC News. ^ "Triple quasar QQQ 1429-008". ESO. Archived from the original on 2009-02-08. Retrieved 2009-04-23. ^ Djorgovski, S. G.; Courbin, F.; Meylan, G.; Sluse, D.; et al. (2007). "Discovery of a Probable Physical Triple Quasar". The Astrophysical Journal. 662 (1): L1–L5. arXiv:astro-ph/0701155. Bibcode:2007ApJ...662L...1D. doi:10.1086/519162. ^ Henry, J. Patrick; Heasley, J. N. (1986-05-08). "High-resolution imaging from Mauna Kea: the triple quasar in 0.3-arc s seeing". Nature. 321 (6066): 139–142. Bibcode:1986Natur.321..139H. doi:10.1038/321139a0. ^ "Quasars in interacting galaxies". Retrieved 19 June 2015. ^ "Extremely rare triple quasar found". phys.org. Retrieved 2013-03-12. ^ Farina, E.P. ; et al. (2013). "Caught in the Act: Discovery of a Physical Quasar Triplet". Monthly Notices of the Royal Astronomical Society. 431 (2): 1019–1025. arXiv:1302.0849. Bibcode:2013MNRAS.431.1019F. doi:10.1093/mnras/stt209. ^ "Surprise Quasar Quartet Defies Explanation". news.discovery.com. Retrieved 2015-05-17. ^ Peacock, John A. (1998). Cosmological physics. Cambridge Astrophysics series. Cambridge University Press. ISBN 978-0521422703. Retrieved 9 February 2012. این صفحه آخرین‌بار در ‏۱۸ اوت ۲۰۱۸ ساعت ‏۱۱:۱۲ ویرایش شده‌است.